Begin. 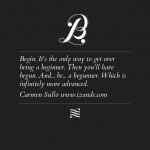 It’s the only way to get over being a beginner. Then you’ll have begun. And… Be… A begunner. Which is infinitely more advanced.